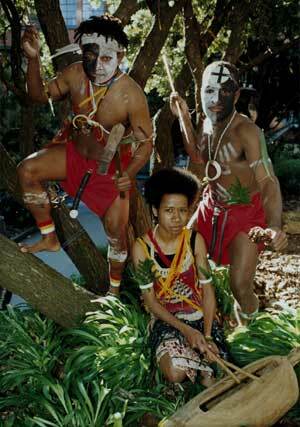 Victoria University students Barley Katit (left), Chanel Iroi (right) and Agnes Gapi perform Papua New Guinean and Solomon Islands love dances at a campus festival in 1994. Although many Pacific islands have only small communities in New Zealand, fresh annual intakes of students help keep the culture of small migrant groups alive. The local communities also serve as a network for young people finding themselves in a strange and somewhat chillier new land.